The Scottish Chess Association (now Chess Scotland) was founded in Glasgow in 1884 and organised Scotland’s first Correspondence Tournament from 1885-87. Although not referred to as a Championship, the winner, John Dillon Chambers, is generally regarded as the first correspondence champion of Scotland (see his game below). The SCCA magazine, edition 119, provides further details. 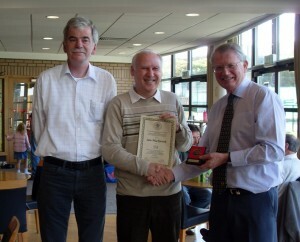 Despite being unable to repeat the success of its team in Olympiad XI Final where it finished in a share of third place, the Scottish Correspondence Chess Association (SCCA) has continued to prosper. Founded on 26 February 1977 at a meeting held in the Glasgow home of Bernard Bowers Partridge (1914-1993), the SCCA celebrated its Silver Jubilee in 2002, marking the occasion with an 129 board Friendly Match “SCCA v. ICCF” played by Email and post. 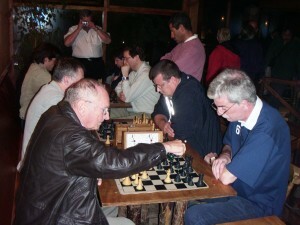 The SCCA has since 1980 produced its own Bulletin, published quarterly, and acknowledged its 21st Anniversary in 2001 with an International Invitational Email tournament which was won by SIM Richard Beecham, nowadays the SCCA’s leading active player, with a very impressive score of 12½/14. Richard also won the SCCA Championship in 2000 and 2001, scoring 100% on both occasions! The SCCA Bulletin was produced and distributed almost since its inception in 1980 by Alan and Moira Borwell until they retired from their joint roles in 2000, passing over responsibilities to Iain Mackintosh who has held the position of Editor to the present day. In 2001 Iain introduced the innovation at that time of an “electronic magazine” distributed worldwide at almost no cost although members of the SCCA may still obtain printed copies. Iain has likewise held the position of President of the SCCA from 2000 to date. The SCCA marked its 30th Anniversary early in 2008 with another “SCCA v. ICCF” match, played this time largely on the ICCF server but with a more modest 38 boards on this occasion. The SCCA web-site was introduced in 1998 under the leadership of Iain Mackintosh who has served as its Web-Master ever since. Iain’s excellent efforts were recognised in 2002 with the presentation of the prestigious “Friend of ICCF” award to the SCCA. Throughout its brief history, the SCCA has enjoyed a considerable level of success and received a considerable level of recognition from the correspondence chess world. Much of this success and recognition can be attributed to the efforts of dedicated volunteers over the years, notable amongst these being Honorary President Alan Borwell and his wife, Moira, President Iain Mackintosh, former President and former Treasurer, David Kilgour, former Vice-President, George Livie, former Secretary and Auditor, Alan Hind and Vice-President and ICCF delegate, George Pyrich. Over the years, a small number of SCCA officials have contributed substantially to the work of ICCF. 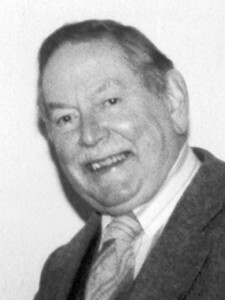 Honorary President Alan Borwell, principal organiser of the two ICCF Congresses held in Scotland (Peebles 1985 & Perth 1994) and, with his wife Moira, arranged preparation, production and distribution of “ICCF Gold”, served as ICCF Treasurer from 1985 to 1997 and as ICCF President from 1997 to 2003. Awarded the title of ICCF Honorary President in 2003, Alan has more recently held the position of Chairman of the ICCF Web-Server Development Steering Group from its inception in 2004 through to its winding up in 2008. Vice-President George Pyrich held the position of ICCF Qualifications Commissioner from 1995 until 2003, later assuming the position of ICCF Deputy President in 2006 and continuing through 2007 when the position was discarded following a restructuring of the ICCF Executive board. More recently, in 2009 George took up the position of ICCF Finance Director. President Iain Mackintosh fulfilled the vital role of Project Manager for the development and introduction of the ICCF Web-Server, providing business analysis and functional specifications. Most recently, the SCCA, under the leadership of Alan Borwell, has organised the ICCF Veterans World Cup events. As mentioned, Scotland has been unable to repeat its success in Olympiad XI Final. However, the SCCA looks to the future optimistically. GM David Kilgour competed in World Championship Final 15 whilst SIM Richard Beecham was unbeaten in a Candidates section of World Championship 28. More recently, strong newcomers IM Tom Matheis and current SCCA champion Stuart Graham have emerged and will doubtless achieve considerable success in due course. With its nucleus of dedicated volunteers and emerging players, the SCCA welcomes the next decade! SCCA President Iain Mackintosh receiving his IM certificate from SCCA Honorary President Alan Borwell. SCCA Vice-President George Pyrich looks on.